Ralph received his B.S. Degree in Accounting from the University of Illinois at Chicago. He is registered to practice as a Certified Public Accountant in the State of Illinois. He has practiced as a CPA since 1979. 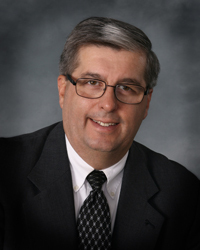 Prior to joining David J. Miller & Associates, LLP in 1989, he served as the chief financial officer of an equipment leasing company and was affiliated with two local certified public accounting firms. Ralph’s areas of concentration include accounting, auditing, tax, computer applications and QuickBooks. He is a member of the American Institute of Certified Public Accountants and the Illinois CPA Society. He has served on the Board of Directors of the Mid-America Association of Equipment Lessors, various committees of the Illinois CPA Society, and as an officer of the Salt Creek Chapter of the Illinois CPA Society. Ralph was born in Chicago, Illinois. He is married to Michelle and they reside in Palatine, Illinois with their children Katie and Chris. His leisure time includes reading, music, board games, attending high school sports activities and Cavaliers Drum and Bugle Corps.